The Somnus Foundation knows the fate of mankind; they promise a tomorrow where humanity will evolve into a godlike form of infinite power. They will lead us there, to a destiny that spans the stars. This is how the future will unfold. The Doctor knows the fate of mankind; the human race is destined to fight and struggle for their very existence, to survive disaster and war and carve an empire from an unforgiving universe. He has seen it with his own eyes. This is how the future will unfold. Beneath the towering headquarters of the Somnus in the streets of Moscow, a dark power is building, and a conspiracy that stretches across eternity is nearing completion. I’m surprised it took this long for a non-prose Doctor Who story to be set in Russia. Even if you ignore the Soviet era (indeed, Soviet spies tried to steal a codebreaking device in The Curse of Fenric), there’s just so much about Russia that could provide the background for an excellent story. The wilds of Siberia. The history of the Cossacks. The Grand Duchy of Moscow. Heck, the relentless determination of the Russian people to endure and survive, no matter what life throws at them, could give the Cybermen a run for their money. Singularity, set in the heart of 21st century Moscow, touches upon the will to survive. A mysterious organization with powerful allies promises the next evolution of humanity, one that the Fifth Doctor knows isn’t due for a very long time. With Turlough at his side and a pair of Russian allies, the Doctor races to figure out the truth behind the Somnus Foundation. It’s a solid, classic Who story, with science gone wrong, innocent people caught up in a bad situation, a companion in peril, and the Doctor saving the day. After a string of “meh” serials and some experimental stories, this story’s few flaws (mainly slightly off-kilter characterization) are easily overlooked. James Swallow is a VERY prolific science fiction writer. His work spans countless fields, from video games (Deus Ex: Human Revolution) to novels (several in the Warhammer 40k universe) to television (Star Trek: Voyager) and even to audio dramas (Blake’s 7). With regards to Doctor Who, he’s done several novels, short stories, and the Big Finish Companion Chronicle Old Soldiers with Brigadier Lethbridge-Stewart. With such a veteran wielding the pen, it’s no surprise that Singularity is one of the better scripts in Big Finish’s recent output. Not only does it contains all the classic elements of a Who story, but it pulls in several elements from science fiction in general, and by pairing the two together “genres” together, Swallow delivers an interesting tale. The new Russian economy mixed with old Soviet paranoia. The ties of family versus the need to belong. Poking your nose in seemingly making things worse. The will of the crowd against the strength of the individual. And several hair-raising scenes, including Turlough’s “fate” mid-way through the third episode and the “experimentation” on the TARDIS. The highest praise I can give this story is this; while driving to RegenerationCon, a normally two hour drive from Fredericksburg to Baltimore, I never stopped listening Singularity, spending the last ten minute sitting in the hotel parking lot because I HAD to know how the story ended. And without giving anything away, the ending to this story might be the closest Doctor Who comes to the classic (and heartbreaking) Futurama episode Jurassic Bark. AKA, the one with Fry’s dog. Peter Davison shines best as a Doctor who constantly lets his curiosity get the better of him, ending up way over his head and flailing about for a bit before getting things under control and sorting it all out. I have two main (and minor) problems with Singularity, and the first one is that, during the third and fourth episode when things are at their worst and it’s the Doctor vs. the Somnus Foundation…the Fifth Doctor’s a bit TOO cheerful, a bit TOO flippant, and a bit TOO nonchalant. He has his moments (such as his realization about what’s happening to the TARDIS during the third episode cliffhanger), but I just felt that there should have been a little more urgency across all of his proceedings at that point. But it’s a very small quibble, as for the most part Davison is on top of his game this time out. He throws himself (and Turlough) right into the situation without a moment’s thought, walks directly into the Somnus Foundation for a chat, and takes the TARDIS back in time and allows a young man to hook himself directly to a medical device to find out information, all before going right back to the Sonmus Foundation and confronting the villains without a moment’s pause. This is classic Fifth Doctor, and Davison gives it his all; charming, inquisitive, and commanding, knowing he’s in charge even when everyone else in the room thinks they’re in charge. But the best moments come when people call the Doctor out on his actions. Turlough proclaims that he’s sick of the Doctor lying to him (the Doctor says they’re landing in Russia “because why not” when in reality he’s tracing a time anomaly), Lena calls him out for sometimes making things worse (does his very presence cause the trouble he seeks to avert? ), and the villains of the piece blame him for their troubles (“This is all the fault of YOUR kind, Time Lord!”). The Doctor is 900 years old at this point, and he lies, he causes trouble, and he sometimes lords his temporal status above others. It’s nice to hear people call him out for it…and it’s also nice that, since he’s 900 years old at this point, the Doctor’s going to just blow it off with a “I’m sorry” that you know he means, but that isn’t going to change anything in the long run. With regards to main range stories, this is easily Davison’s finest performance in a very long time, especially the calm and gentle way the Doctor comes across in the story’s final moments. It’s no secret I am a Turlough fanboy. Male companions are a rare breed in and of themselves, but Turlough is not only a “bad teammate turned good,” but someone who never seemingly bought into everything the Doctor was selling. And nobody, nobody, does “dear GOD, you’re all insane and I’m the only rational one here” than Mark Strickson. 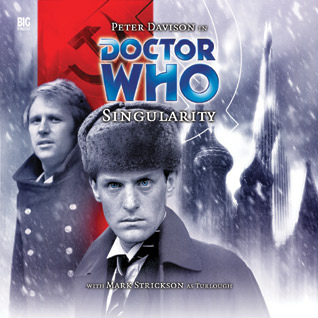 The same minor concern I had with Peter Davison’s performance kind of carries over to Strickson, as it seems like nearly every line Turlough has during the first half of Singularity is a snarky, cross comment. While Turlough was the sourest knight in the TARDIS for sure, Swallow’s script cranks it up to 11. It’s the same concern I have with some writers for Peri, where everything she says is sarcastic and flippant. The switch is flipped, however, when Turlough finds himself having to talk Lena out of saving her dying mother during the trip to the past. Strickson many not do as many audios as the other companions, and he may have traded acting for producing wildlife documentaries (the man has a Zoology degree from the University of New England in Armidale, New South Wales), but when given the right material, he shines. He tells Lena about his own problems, concerns, and heartaches, and the listener can feel the words convince Lena to head back to the TARDIS…but not before vowing to give the Doctor a piece of her mind for putting her in that situation in the first place, something Turlough can easily relate to. I’m going to take a page from another reviewer here for a second, who brought up a very interesting point with regards to Turlough. During the third episode, Turlough finds himself captured (again), chained up (AGAIN), and then submitted to the same body-swapping procedure as Alexi before being flung to the very end of space and time; Ember, the last planet orbiting the last dying sun as entropy spreads across the galaxy. It’s here, where human beings have given up, that Turlough, an alien (“You look human.” “Have you considered all humans look like they come from Trion?”) steps up and takes charge, even if it’s as simple as “I’m not going to sit here and die, I’m going to go head on and smash something with a pipe.” Turlough’s internal conflict is the same as the Twelfth Doctor’s; is he a good man? Turlough is a coward, he’s left his companions and the Doctor to die to save his own skin, but he always goes back for them. When the chips are down, he’ll step up to save the day…but it’s because it’s HIS life on the line as well. Doctor Who has plenty of villains who do the wrong thing for the right reasons. I think one of the reasons I like Turlough is that, in the end, he does the right thing for the WRONG reasons, but he still does the right thing. It’s an interesting philosophical quandary, “the ends justify means” but in a reverse, mirror-like way. And no actor other than Mark Strickson can pull off such a quandary. A lot of the complaints about Singularity have been that the Russian characters often come off as very Rocky and Bullwinkle “moose and squirrel” stereotypes. Which I find kind of funny, as half the supporting cast are actual Russian actors! Natasha Radiski plays Lena, and does a great job as both temporary companion and temporary antagonist, as she calls the Doctor out on his meddling even as she seeks his help in rescuring her brother Alexi from the Somnus Foundation. She comes off as a caring sister and a long-time friend to Pavel, played by Max Bollinger (who also stared in The Waters of Mars). Pavel knows something is up with the Foundation, and risks his life to find out what it is, with a great sense of paranoia and bravery that’s a bit akin to Turlough. Oleg Mirochnikov’s Alexi is the secondary character who gets in over his head, and he sells his character’s terror at realizing the bill of goods he’s just been sold. Maitland Chandler (who appears in the next main range audio, Other Lives) and Eve Polycarpou are the heads of the Somnus Foundation and the two villains of the piece (along with a minor villain, the jailer Xen who puts the stolen human through their punishment paces on Ember). Chandler’s Seo is the head of the Foundation and the leader of the aliens, while Polycarpou’s Qel has her own agenda, one that specifically involves a TARDIS. Both villains are played as evil, competent, and utterly ruthless, seeing the humans in Moscow as nothing more than dirty savages. They’re both ambitious, accusing the other of treachery and “interfering with the Great Plan,” something the Doctor plays on and exploits during the climax after seeds of discord had been planted throughout the story. The pair is great at playing the bad guys, and their final fates are well deserved. Gary Russell does a good job of keeping the action going throughout the story, bouncing back and forth between the Foundation/Ember and the Doctor/Turlough without either feeling rushed or outstaying their welcome. The sound work is great as well, especially the distant feeling of Ember and the decaying bodies the kidnapped human personalities are forced to inhabit, along with a Moscow being forced to become a hive mind and pursue the Doctor through the empty streets. As an aside, the CD covers for Singularity are among my favorites from Big Finish so far, both the original at the top of this review and the alternate one at the bottom. Even if the flag is wrong, I love it just for the look on Turlough’s face. Now, even though this story came out three years earlier, there definitely are a lot of parallels to The Sound of Drums/The Last of the Time Lords. An alien race from the end of everything has come back to modern day Earth in order to wreak havoc and renew their own lives through horrific means. There’s just a lot less scenery chewing in Singularity than there was in those two episodes. With the talk of decaying flesh and rusting bodies, my first thought was “Cybermen, it’s the last of the Cybermen.” But I was pleasantly surprised by the identity of the aliens. Who they were, why they picked human beings, and why they kept referring to them as “filthy savages” made perfect sense. The core reason behind their plan, however, causes a listener to stop and think. At the end of everything, when time is literally running out, the Time Lords left this universe for a new one. And they took their favorite species to start over again, which didn’t include this particular race. Their plan is to come back in time, force humanity to uplift into a massive gestalt consciousness, and wipe out the Time Lords in revenge…starting with the Doctor, the one Time Lord who SHOULD have interfered, as he always did, but chose this time to sit on the sidelines. It’s an audio that could never be written, but it’s a great idea. The Time Lords COULD have saved them…but if you’re so desperate to live that you’d hijack and rewrite the past, then the Time Lords have every right to leave you behind, you rotten, rotten nutters. And again, the very last scene…some might find it bland, but I found it very bittersweet. What other Doctor than Five could have pulled it off? Last Time Lord in the galaxy, please turn off the light. 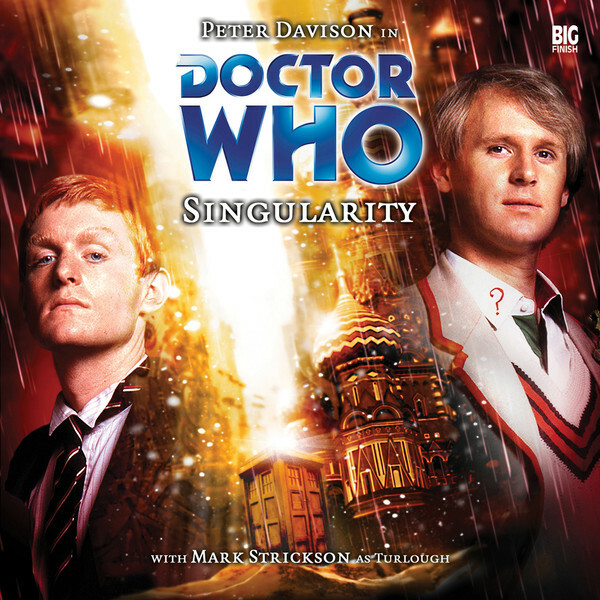 Singularity is a story I feel I could hand to a newcomer to Big Finish and say “give it a whirl.” It’s got all the classic Doctor Who and science fiction trappings, with a strong script, interesting plot, and solid (if slightly mischaracterized) acting, all set in a familiar land that still holds an air of mystery. It’s Strickson’s last audio for five years (he won’t return to the main range and a Companion Chronicle until 2010), and it’s a very solid one to go out on. This entry was posted in Big Finish Review and tagged 4/5, Big Finish, Big Finish Audio, Big Finish Review, Doctor Who, Doctor Who Audio, Doctor Who Review, Fifth Doctor, Mark Strickson, Peter Davison, TARDIS, Vislor Turlough. Bookmark the permalink.